Just what is lycanthropy? Is it just a curse? Is it a disease? Are there other ways it can be passed on that we don't know about? Lycanthropy has long been poorly understood, and this lack of knowledge has fueled paranoia, those afflicted with it looked upon as dangerous and frightening. Things have improved somewhat in recent years. Ever since known werewolf Remus Lupin died a hero at the Battle of Hogwarts, the dialogue about werewolves has shifted. This opened the door to new research, and a slightly improved understanding of lycanthropy. It is now known (though not universally) that the child of a werewolf is not born with the curse, but may show certain "wild" personality traits, not unlike some that survive werewolf attacks without becoming lycanthropes. It is also now strongly believed by healers that werewolves in human form cannot infect another with lycanthropy. Despite efforts by social action groups to spread awareness and encourage acceptance of the afflicted, old prejudices die hard. Werewolves still face discrimination in the wizarding world, and even those that consciously accept lycanthropes often feel the old, chilling fear when actually confronted with one. A werewolf is a human who has been infected with the curse of lycanthropy (or "werewolfry" as it is sometimes known). Werewolves are shunned and actively discriminated against by most members of wizarding society. They are required to register with the government, and failure to do so can result in a known werewolf being marked for hunting. The curse is transmitted by the bite of a werewolf in its wolf form, generally during the full moon. It is possible that there are other methods of infection, as well. Werewolves are identical to humans except during the approach of the full moon at which time they begin looking sick. Under the light of the full moon it is almost impossible for someone suffering from lycanthropy to prevent their shift into a wolf. Werewolves in animal shape become highly aggressive towards humans, even those they consider friends or loved ones, and pose a very real and imminent threat to the lives of anyone nearby. Interestingly, werewolves are generally not a threat to animal life, including transformed Animagi. On the full moon, werewolf hunting parties are allowed on public land (and on private land when invited) to hunt and capture rogue werewolves that have not yet registered themselves. Sometimes, if a werewolf proves to be too dangerous, it has been known to happen that the werewolf is shot down and killed. But regulation states each hunting party must include a MACUSA-licensed werewolf hunter, so that all measures are taken before any violent force is required. In human form, a werewolf is usually indistinguishable from any other wizard. They will often have scars, both from the original wound that infected them, and from self-inflicted wounds and later battles. Werewolves that have embraced their bestial nature can begin to look more wolfish even in human form. In wolf form, a werewolf is barely distinguishable from a natural wolf. Those that know what to look for can identify a werewolf by their unnaturally large size, foreshortened muzzle, and tufted tail. Contrary to some beliefs, a transformed werewolf is not a hybrid "wolfman". It is a quadrupedal creature. Werewolves that have embraced their curse will eventually begin to look the part. When they permit the "wolf" to affect how they live their human lives, they gradually take on a more bestial appearance — such as increased facial hair, heavier brows and jutting jaws, enlarged canine teeth, thick nails that resemble claws, etc. Werewolves that began life as normal wizards can cast magical normally while in human form. When in wolf form, their only magic is the ability to pass on the curse of lycanthropy. There is no cure for lycanthropy. If it is possible, it has yet to be discovered. There are plenty of legends about how it might be cured, but none have proven successful. The closest thing to a cure is the Wolfsbane Potion, invented in the late 20th Century. The werewolf must take a dose of the potion (about a gobletful) every day during the week prior to a full moon. If even a single dose is missed, the effect is ruined. If taken properly, it eases the symptoms of the change, allowing a werewolf to retain their human faculties while transformed. It also renders them quite drowsy, allowing them to sleep comfortably until dawn. Werewolf characters can be a challenge to play, due to the fact that every night of the full moon, they turn into a murderous beast and lose control. A werewolf cannot "tame" their beast inside, no matter how strong their will is. This is a curse, not a blessing. 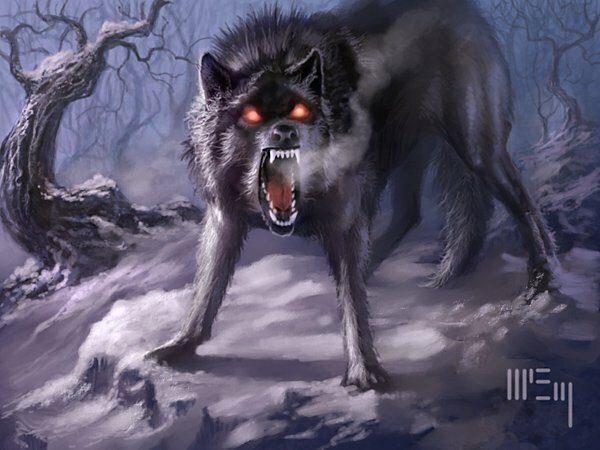 A werewolf under the effects of the Wolfsbane Potion can retain control while transformed, but is heavily sedated, suffering -2 modifier to Speed and Defense, and a -3 penalty to all rolls. Remaining awake requires a Resolve + Stamina roll, modified by the -3 penalty. Further rolls to remain conscious must be made every hour. A character that is bitten by a transformed werewolf risks contracting the disease. This is assuming that they survive the wound itself, which is a cursed injury, and therefore does not heal easily. A mixture of powdered silver and dittany can seal the wound and prevent the victim from bleeding to death. When bitten, the victim's body begins a battle with the disease. He must make an extended action, rolling Stamina + Resolve + Sortilege. He gains a +1 bonus if silver and dittany is used, and an additional +2 bonus if being treated in a magical hospital. Rolls are made every hour. The number of successes achieved by the end of the extended action determines the final condition of the patient. 10 or less The victim dies an agonizing death. 11–15 The victim survives, but will become a werewolf on the next full moon cycle. 16-20 The victim does not contract lycanthropy, but still develops carnivorous habits. 21 or more The victim has staved off the curse completely, with no side effects! There is no way to know for sure if a surviving victim has contracted lycanthropy for the first month. The first full moon cycle following the bite will reveal whether or not the curse took hold. Regardless of the outcome (unless an Amazing Success was achieved), a victim that survives will develop a powerful appetite for meat (the rarer, the better), and possibly some aggressive tendencies.